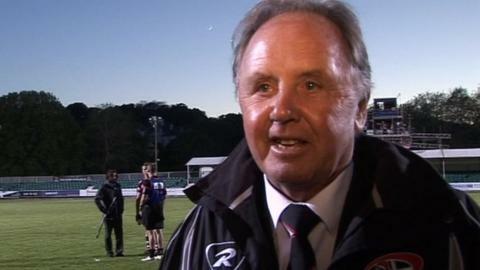 Cornish Pirates owner Dicky Evans says it is a "disaster" for Cornwall if his club cannot move to a new stadium. The Pirates lost the first leg of their Championship final against London Welsh 37-21 on Wednesday. But they cannot be promoted until they move to a new stadium, and they had a funding application rejected last week. "I don't understand the people on the council and why they're driving people to vote against something Cornwall needs desperately," he told BBC Sport. "They're going to take away rugby," he continued. "It's a disaster for the young people of Cornwall." The Pirates have been severely limited in their ambitions by their current home, the Mennaye Field, which does not meet the Premiership's minimum capacity criteria of 10,000. And despite reaching the Championship play-off finals for a second year running the Pirates have no chance of joining the English elite until they can relocate to a stadium that is big enough. The trouble is none exists in the county so the club had hoped to share a proposed Stadium for Cornwall with Truro City Football Club and the local college, but the Cornwall Council voted against granting £10m towards the new stadium. Evans added: "I don't have the cash to build my own stadium. I've spent a lot of money on this rugby club. But if we had the chance of a stadium, we would definitely, definitely, attract 10,000 people. "There's not a bed available tonight with all the people coming to this game." London Welsh put aside their own disappointment of finding out before the match that they are also not eligible for promotion to the Premiership, to claim a dominant win over Ian Davies' side. Davies admits his side now face an uphill task in the second leg on 30 May. "We finished strongly, which bodes well for next week, but at the same time we're 16 points behind so we've got it all to do," he told BBC Radio Cornwall. "We've got to be realistic. If anybody said we were favourites coming into this game, we're certainly not favourites for the second leg, so we can relax a bit and play. "We've got to make sure we stay on task, and don't get caught up in the emotion of trying to chase down 16 points. "We certainly can't make as many mistakes next week because the Welsh will kill us."